What would Facebook aficionados like more than to extract their friend collection and put it in an instant messenger app? Hmm… Making an awful lot of money perhaps. But for those who find that prospect a bit too hard to reach, they can at least indulge in chatting with their Facebook friends without having to see the timelines and the news feeds. Facebook Messenger is not just an offshoot application… well it might have been at some point, but right now is a fully fledged mobile instant messenger application. And best of all, the package includes your friend list. The contact screen lists your contacts but with a twist. 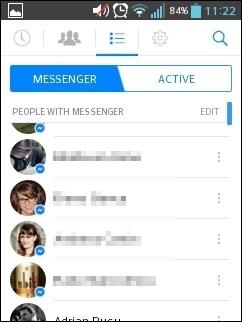 It features two lists: “Messenger” and “Active” One contains all of your friends who use Facebook Messenger while the other one shows the contacts who have been active recently. But this is kind of redundant. I mean, why would you care if somebody uses the messenger or not? Moreover you will need to look up friends that have been away for 6 hours or simply don’t use the messenger, because they won’t appear on these lists. This is actually not a big deal if you’re aware of it but might become confusing at first. Another confusing choice of interface is that friend images are marked with either a grey Facebook icon or a blue Facebook Messenger icon, both of which give the fake impression of conveying online statuses. 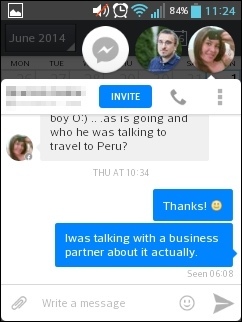 Groups is a more recent feature to the messenger. It allows you to pick up on existing conversation groups or create new ones. Be advised that everybody involved will be notified. But the coolest aspect of Facebook Messenger are the chat heads. These work like little notification pop-ups that appear whenever you get a new message. Although pop-ups might be annoying in general, these one have received a good education and only show you a small circle of who has messaged you and with how many lines. You may then dismiss it by dragging it to the bottom of the screen, you may re-locate it by dragging it to any other edge. But the magical part comes in when you tap it. If you do then it won’t bring up the messenger but instead it will just extend to show you the conversation and any other active chat heads. You can then type back, switch to another chat head or simply tap it back to its un-invasive form. I believe that the contact lists could have had a better layout but this is not horrible either. Considering that you still see all of your recent contacts on a separate list, then the issue is minimized. The Chat heads are great though. I love them! Audio calls are the healthiest part of Facebook interactions. The contact list and icons are a bit confusing. The Groups feature is not optimized for every screen size. Facebook Messenger is probably a must if you often communicate via Facebook. Not only that, but it’s also a very good looking app.